Yesterday the hubs and I took a little "field trip". He needed a break from building and repairing furniture...and I needed a break from painting it. So...we headed over to see my favorite "chandelier guys". 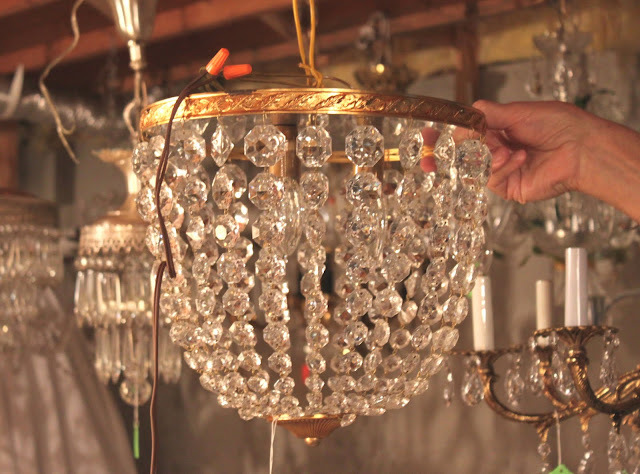 They are two men that clean and restore vintage chandeliers and sell them to women like us that just can't get enough of them! I was lucky enough to make it into the treasured storage space for all their chadis. I swear as I made it to the bottom step and into their basement angels started to sing...well, not really, but they may as well have! Now, be warned. These photos are not pretty, but the chandis were. 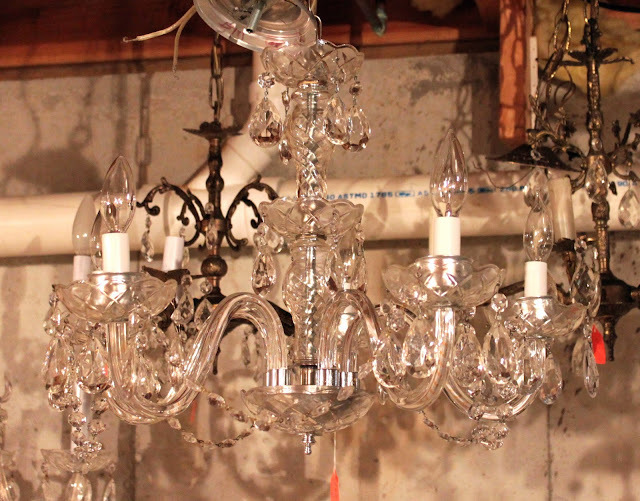 Taking photos in a basement just does not do these beauties justice, and I couldn't bear to ask 2 men in their late 70s if we could haul each one upstairs so I could get better pics outside. So, they are what they are...but I wanted you to see what they had. This was just one corner...the chandis went all down one side of their basement. There must have been 75 of them too choose from...and their prices were very, very good. All I heard from my husband behind me was "Oh, boy. Here we go." 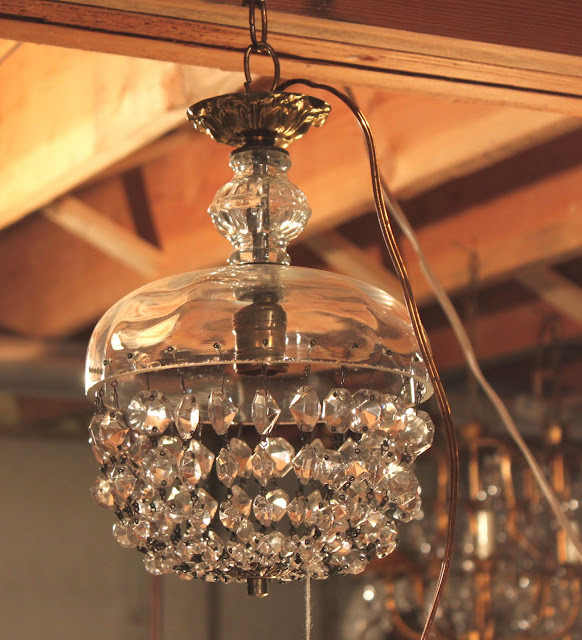 There were chandis that were all glass and crystal...I always love those the most. Some heavy on the crystals...some a little more simple. There were some reeeeallly cute petite chandis, too. 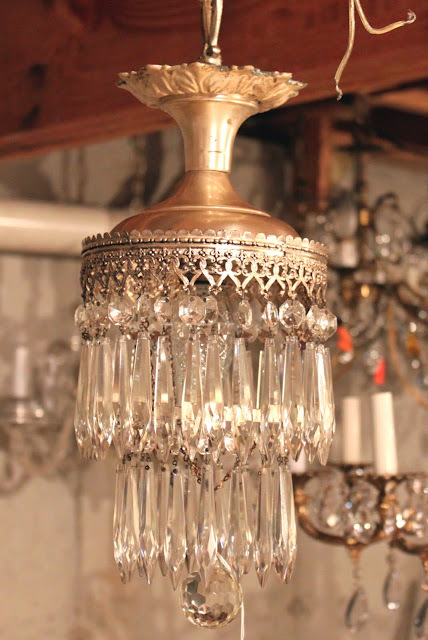 I would LOVE a little one like this is my bathroom...or above my kitchen sink as a pendant. I am going to have to remember this one since I will be starting a kitchen reno in a few months. This one would be great in a foyer...it does hang straight, but the crystals are so heavy it won't be straight until it is up on the ceiling. This is the one I bought for my office. I think it am going to paint it gray and distress it. My office is all white, so I think that will be perfect! And these two were my FAVS! Seriously, I stared at them for so long, my husband finally just said, "so why don't you buy them so you can stare at them at home". I love that man. He is just the best! But, I have a house with ceilings too low to handle these, and I am still sad about it this morning. I asked my hubs if we could move just so I could have a place for it. He agreed. The metal that holds the crystals is my favorite part. All made by hand. This chandi is stamped with the manufacturer name and the year it was made on the inside. I believe it was 1927. This style is called a 'wedding cake chandelier'...love that. Can you imaging the house this came from? It bet it was stunning! This little mini one matched it. I love the bits of old paint on the ceiling cap. I really, really, really wanted this one for my foyer...be he didn't want to separate the pair. I love days like this when I can escape the paint fumes and sawdust and go look at beautiful things. A wonderful friend I have made here in blogland reminded me the other day just how lucky I am to be able to what I do for my job. I am so glad she did...because it is so true! I would be so unhappy working behind a desk all day. This is what feeds my soul. Searching through old barns, finding those out of the way junk shops, meeting people unexpectedly that sell great things out of their basement...it is so much fun! I can't see mylself doing anything else. My little biz is celebrating its 10 year anniversary April 1st...here's hoping for another successful 10! Because I will take wearing my favorite dirty boots over heels any day! Oh, my - those chandeliers are gorgeous! I need about 4 of those for my house. I'm excited to see the one you got painted grey. I think it will be beautiful! Wow, there's some real beauties there. My eyes would have been out on stalks looking around and trying to choose one let alone more! Love your choices. I found your blog a few days ago, and loved what I saw. Thank you for sharing with us. I would take sawdust a pair of boots over heels any day too...hmmm, makes me think!! And miss mary there is something I need to tell you, but I will just have to show you soon...my dear we are so on the same page!! :) love all of these...! muwahh! heaven is right my friend! Would so love to have a store like that around here! Oh my my! My Mom is going to lose it! I'm so envious of your job...I really want to do this full time! Anyway - I'll send Mom a link :) Prepare to be hearing from Janie soon! wow. really, really beautiful. would you be able to share where this magical place is? would they ship these treasures!? I actually need two 'matching' light fixtures and those two they wouldn't seperate, would be more than perfect!! Wow, what a wonderful place. Can I ask where it is? I just noticed that your furniture is carried in Crystal Lake and you are doing the Kane County Fair. I am just east of St Charles and was wondering if it was any where remotely in the area? P.S. You are very lucky to get to do what you love, but you are also very good at it. 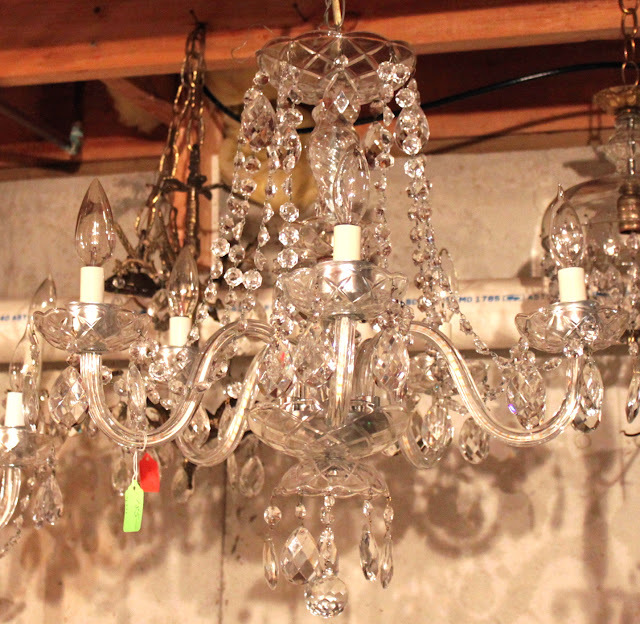 ooh you hit the mother load of chandeliers! I can't wait to see the one in your office. Oh man...like HOW good are the prices? Maybe they could ship me one! You coming to the sale in May??? Check my sidebar for details! Your husband sounds like mine, they make the same comments ha!!!! WOOOOWWW how amazing is that. I would have chosen the same chandies too. I have a similar one to the wedding cake chandie hanging on a bird cage stand. Its one of my favs! Oh Mary, I hear you I could never work behind a desk! It is so much fun doing what we do. Cheers to another 10 great years!! Congrats on your 10th year of business. 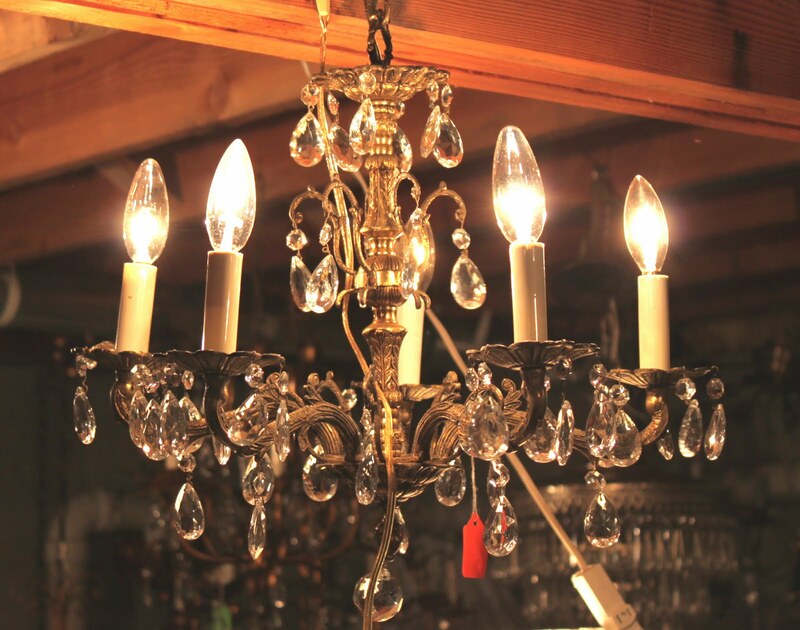 The chandelier tour was really fun. Me too! Well, I like being a fine mix between muddy boots and shopgirl girly. Does your husband ever take your picture at the moment you first see junkin' Disneyland like that basement? That would be cute! 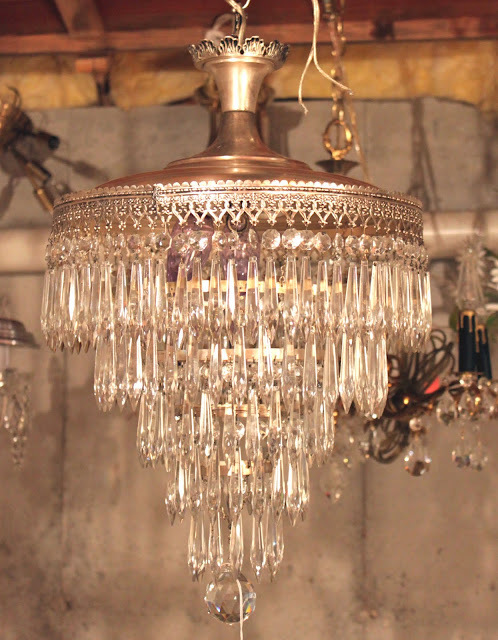 ps I have a sweet little crown chandy waiting for some love...its only missing every single one of its crystals. Even with that it is sooo pretty! I love the wedding cake... I have been lusting after one like that for awhile now. And, that little one for the foyer is fabulous. I want beautiful lighting in every room. Thanks for sharing the eye candy! So pretty! I love chandies, especially my new one, I can't stop staring at it:) I really need to get things done though...LOL! <y faves are the two small ones...in fact, the last one I would like for my petite entry way....do these guys come to Kane? I might have to go on a mission with you in April, if not.